Hi - 1st Post so please go easy - been looking for a lawnmower and this seems a good deal - 25% off and cheaper than the lesser 370 model and in stock. Seen it. Bought it. Nice. Should have held off on the 370, both good deals but preference would have been this the more powerful motor. Nice bit of kit for the money...good spot! Bought the equivalent model rotak when it first came out, about five years ago. Replaced the cutting blade this season cost £20, now cuts as good as new. This model is 1800 watts, as powerful as a basic petrol but a fraction of the weight only drawback over petrol is cable and care in the weather. 5% Quidco and free delivery. Got one of these last week, great price and mower. HEAT! Wanted a petrol one really but after the debacle with a Tesco own-brand petrol lawnmower I've opted for this. Thanks OP, heat added. Is this the current model, I bought a Rotak 40 three weeks ago from Homebase for £136. Wondering if I can return it for the 430? I bought this last week in BnQ to replace my old Flymo 350 burnt off before. Comparing with my hover model the substitute is not so easy to move but produce better look. Downside is that even at 1800w it easily stuck when mowing long grass to the root at shift 2 and the container gets full quickly. BTW, any one knows the difference between Rotak 430 and Rotak 43 which is still selling at £179 in BNQ? Lastly 430 is not even officially listed on Bosch website. Nice spot. Heat for you! I bought this last week in BnQ to replace my old Flymo 350 burnt off … I bought this last week in BnQ to replace my old Flymo 350 burnt off before. Comparing with my hover model the substitute is not so easy to move but produce better look.Downside is that even at 1800w it easily stuck when mowing long grass to the root at shift 2 and the container gets full quickly.BTW, any one knows the difference between Rotak 430 and Rotak 43 which is still selling at £179 in BNQ?Lastly 430 is not even officially listed on Bosch website. Just checked my manufacture date, it says March 2013. Even though it hasn't got the Ergoflex handles.Seems like the 430, 320, etc are older models. But still a bargain. Looks like the 430 is just the older version of the 43, so there's a chance that B+Q are selling off old stock. But on the other hand, there's no reason why the 430 should be significantly different judging by the specs. The bosch website (http://www.bosch-garden.com/gb/en/garden-tools/garden-tools/rotak-lawnmowers-199956.jsp) shows the 43 as the current model. I bought the 43 model in June from Amazon for about 150 after my last crappy B+D mower died. I can honestly say it is excellent, very solid build quality and goes through long grass like a knife through butter. The ergoflex grip thing makes a big difference too. I would have no hesitation in buying this one had i not already spent my money. I got the Rotak 43 Ergoflex a couple of years ago for £150....if the 430 is the same (which it appears to be) or better, then this is a great price. Looks like the 430 is just the older version of the 43, so there's a … Looks like the 430 is just the older version of the 43, so there's a chance that B+Q are selling off old stock. But on the other hand, there's no reason why the 430 should be significantly different judging by the specs. The bosch website (http://www.bosch-garden.com/gb/en/garden-tools/garden-tools/rotak-lawnmowers-199956.jsp) shows the 43 as the current model.I bought the 43 model in June from Amazon for about 150 after my last crappy B+D mower died. I can honestly say it is excellent, very solid build quality and goes through long grass like a knife through butter. The ergoflex grip thing makes a big difference too. I would have no hesitation in buying this one had i not already spent my money. I don't think 430 is an older version of the 43. I'm pretty certain the 43 was in the first batch of Rotak's that had the Ergoflex handles...and I don't recall there being a 430 version around 2 years ago when I bought my 43. I bought one of these (Bosch Rotak, maybe a slightly different model number) a couple of years ago. While it does a good job cutting the grass & getting close to the edge, it is pretty unweildy. Despite having quite a large lawn, I would likely go for a more manoeuvrable mower if I had my time again. There aren't many self propelled electric lawnmowers out there, self propelled are normally petrol. Also...I sincerely doubt you'd find one even close to £129, and certainly not one of similar quality to a Bosch Rotak. I have a Rotak 43 (I think it's the 43), bought a couple of years ago and it performs brilliantly. Nice and wide deck, light and a large grass box. I would recommend it to anyone (I replaced an aging petrol and wouldn't go back now). The only thing I did was have a longer cord made up due to size of the garden. Bought the equivalent model rotak when it first came out, about five … Bought the equivalent model rotak when it first came out, about five years ago. Replaced the cutting blade this season cost £20, now cuts as good as new.This model is 1800 watts, as powerful as a basic petrol but a fraction of the weight only drawback over petrol is cable and care in the weather. Well I have to say most good electrics have a lot more torque, my electric ploughs through long damp grass when my neighbours £400 petrol mower is stalling if he doesn't crawl along at a snails pace whilst I am marching along :-) I would never go for a cheap petrol over a powerful electric unless the garden size made it unfeasible. There aren't many self propelled electric lawnmowers out there, self … There aren't many self propelled electric lawnmowers out there, self propelled are normally petrol. Also...I sincerely doubt you'd find one even close to £129, and certainly not one of similar quality to a Bosch Rotak. Thanks. The cheapest self-propelled electric is twice the price. I purchased the Qualcast 1800w electric for £100 from Argos with 2 year warranty. Very poor build quality. Grass box broke in first cut and handles do not stay in place. I was thinking of taking it back for the second time! I miss my self-propelled petrol mower. Petrol mowers are heavy, but self-propulsion is wonderful! Pushing mowers is hard work. dont need a mower but if i did, this would be it. There is no battery in this model, it's always plugged in....Wanted a … There is no battery in this model, it's always plugged in....Wanted a petrol one really but after the debacle with a Tesco own-brand petrol lawnmower I've opted for this. Thanks OP, heat added. Actually I had no problem with the cutting, and it was self-propelling so the weight wasn't really an issue. But the starter cord frayed after 3 uses and snapped after 5 uses. Used it to cut the grass today. Really impressed with it actually. One minor thing to note whilst assembling it, the screws needed pre-screwing in to the metal arms before you try to fit them on to the body of the mower, otherwise there is no way you're going to get those in. Its so light I don't even think I'll miss my self propelled petrol mower. 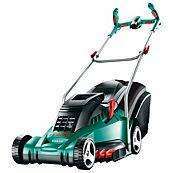 B&Q are now giving away a free grass trimmer when you buy any Bosch lawn mower, including this one. Done a bit of Googling ...but cannot find out what the Difference is … Done a bit of Googling ...but cannot find out what the Difference is between 430 and 43 (aparty from price)Can anyone shed some light? No difference at all, the 430 is an exclusive model to B&Q, and the 43 is sold everywhere else. Deal posting newbie! This is LRGy first deal post. Help out by leaving a posting tip or just to show your appreciation for their contribution.